On February 27, 2016, Angela was walking away from the beauty parlor around eight o’clock in the evening. Since it was dark and poorly lit outside, she was unable to see the uneven pavement ahead and tripped over the raised pavement. Angela stretched out her left hand to reduce the impact of the fall and injured her left hand as a result. Thankfully, a young man was near to help her get up and her daughter was right across the street to assist as well. Angela went to Brookdale Urgent Care Center where she was treated and released. 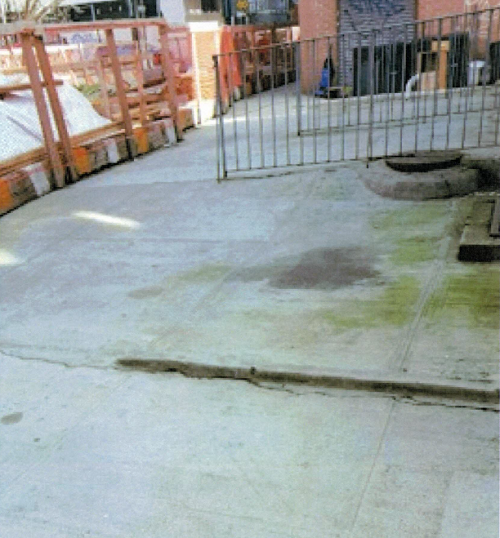 As a result of her fall, Angela suffered left hand pain and had difficulty making a fist (closing her hand completely). The hospital discharged Angela without performing x-rays or even documenting her visit, since they believed it was a minor injury. Soon after she left the hospital, Angela experienced severe swelling and pain in her left hand. Her hand was put in a cast for approximately 3-4 weeks and once her cast was removed, she went to physical therapy for over a year. As a fan of Adam’s radio show, Angela’s sister referred her to The Case Handler team! With the help of our legal team, we took care of all her medical bills by successfully recovering the maximum $10,000.00 compensation award to reimburse Angela for her medical bills, AND we recovered $140,000.00 for her bodily injury claim from the insurance company! 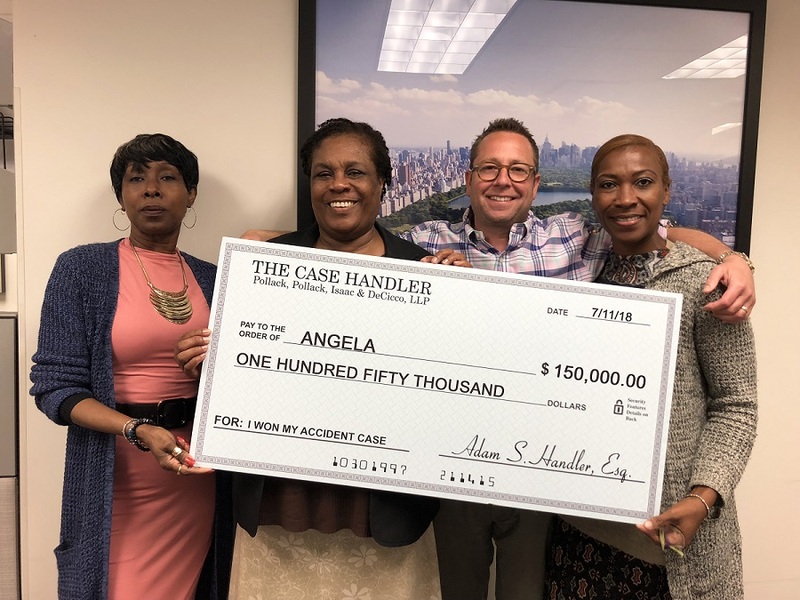 Overall, Angela obtained a total settlement of $150,000.00! For a free consultation with Adam Handler – The Case Handler, contact his office at Pollack, Pollack, Isaac & DeCicco, LLP by dialing 929-223-4195. **Attorney Advertising. Prior results do not guarantee a similar outcome. "$1,500,000 Verdict — Rear End Car Accident Results in Herniated Disc (New York County)"
"$831,803.85 Verdict — Rear-End Car Accident (Bronx County)"
"$485,000 Settlement — Uber Driver Rear Ended in 3 Car Collision (New York County)"
"$250,000 Settlement — Rear-End Car Accident By Drunk Driver Results in Severe Injuries to Both Knees (Queens County)"
"$182,500 Settlement — Car Accident Results in Right Shoulder Injuries (Bronx County)"
"$100,000 Settlement — Citi Bike Rental Bicyclist Doored By Taxi Cab (New York County)"
"$50,000 Settlement — Motorcyclist Thrown Off Bike By Vehicle that Ran Stop Sign (Queens County)"
"$1,950,000 Settlement — Trip & Fall Accident Due to City Negligence (Bronx County)"
Pollack, Pollack, Isaac & DeCicco, LLP is located in New York, NY and serves clients in and around Brooklyn, New York, Long Island City, Sunnyside, Maspeth, Astoria, Woodside, Middle Village, Ridgewood, Elmhurst, Jackson Heights, Rego Park, Staten Island, East Elmhurst, Jamaica, Bronx, Bronx County, Kings County, New York County, Queens County and Richmond County.